Caring, united, democratic: CTU is more than 25,000 teachers, paraprofessionals and clinicians acting as one. Learn about fellow members. Ensure that union staff can keep you in the loop. Participate in our democracy. In every school and workplace, unity in action protects our members and the students we serve. Learn how to stand up for your rights, unite with fellow CTU members, and get help from CTU staff when you need it. Along with parents, students and community we advocate for the schools – and the city – that our students deserve. Learning, working and living conditions are not separate. Together, our Union wages a comprehensive fight. No educator’s impact can ever be fully measured, which is why your daily struggles and victories deserve to be told. 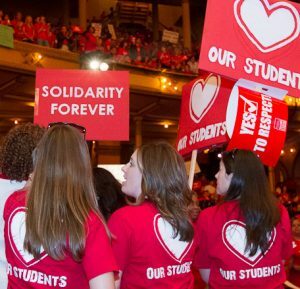 In the Chicago Teachers Union, we celebrate one another. Caring, united, democratic: CTU is more than 25,000 teachers, paraprofessionals and clinicians acting as one. 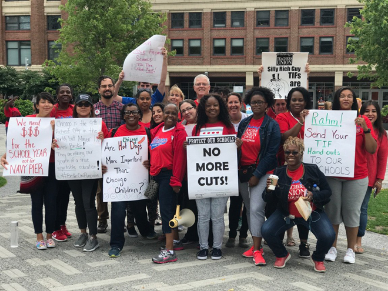 We’re continuing to bargain contracts with charter operators at CTU’s unionized charter schools — and for more than 25,000 CTU educators at district-run schools, where our contract expires after this school year. Our unity, our strength and our power must be organized and deployed to win good pay and good conditions for teaching and learning in the Chicago Public Schools. This 2018 update to CTU’s 2012 report, The Schools Chicago’s Students Deserve provides a counter-narrative to the corporate agenda on education. SCSD 2.0 highlights the many racist inequities that have continued, or in some cases worsened, since 2012. 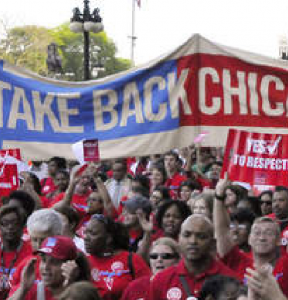 CTU has a track record of fighting for reforms to change these realities, which is why Chicagoans continue to trust the CTU more than the Board of Education, more than Mayor Emanuel and more than any “reformer” backed by billionaires and corporate foundations.